I have just discovered next door to the MediaLab Prado is a treasure of an art gallery. 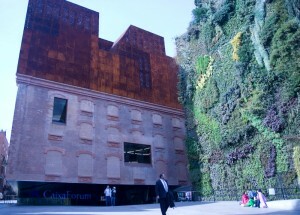 The Caixa Forumz which only opened in early 2008 is a great example of modern architecture and displays a great collection of art. There is a fabulous section at the moment called Risk areas which is full of art that is about pertinent social issues of our times such as war, migration, money, rituals and gender divisions. My personal favourite is the Welcome to Guantanamo Museum. It’s about our penchant for remembering horrors that we have perpetrated and was born out of the idea that Guantanamo should be turned into a museum. The display includes miniature models of Guantanamo and an electric chair as well as a life sized torture helmet and a pair of boots with a hidden chamber for a suicide pill. The whole display is an example of modern art at it’s best – attempting to portray and question the world around us. This entry was posted Monday, February 16th, 2009 at 4:02 pm	and is filed under Art. You can leave a response, or trackback from your own site.